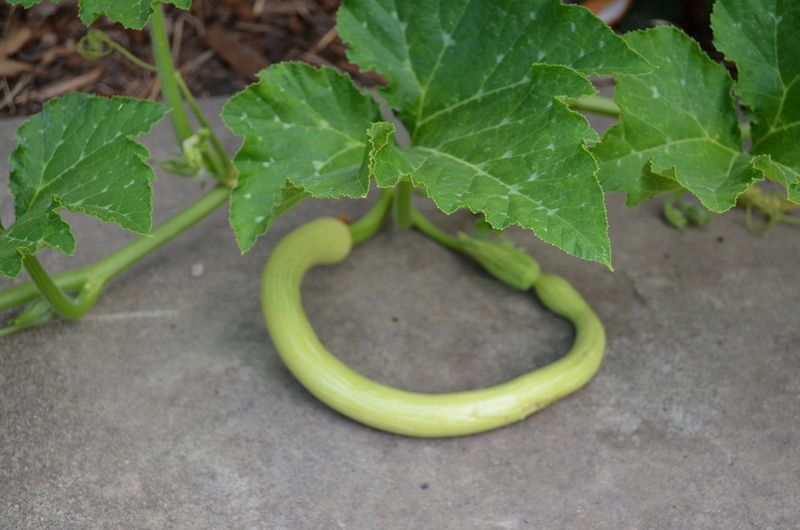 This year I decided to grow an heirloom climbing summer squash called Trombetta di Albenga. My friend grew it last summer and quickly sautéed it for dinner one night when I was at her house and it was delicious! The best part about this squash is that it is seedless and firm so it doesn’t get watery or mushy like Black Beauty zucchini. That’s right folks. 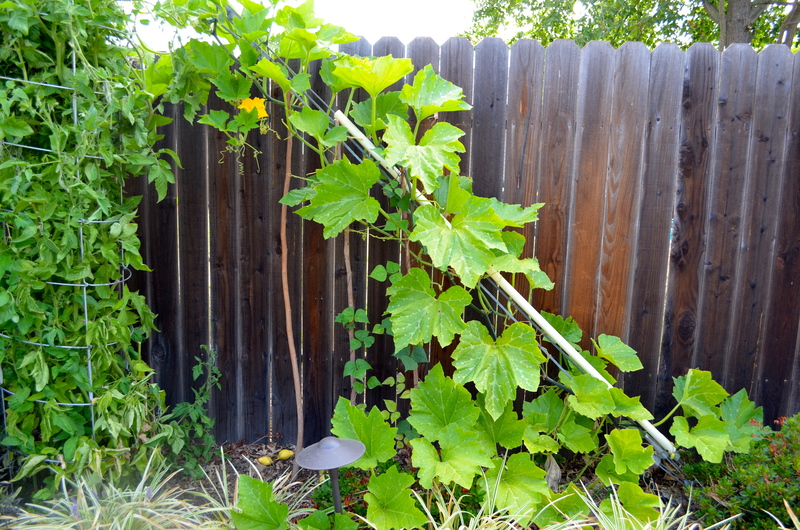 Unbeknownst to me, this giant squash was quietly growing. I’m not sure the picture does it justice. This thing weighed in at 8 and a 1/2 pounds! It is 3 feet tall. This thing is the size of a toddler. 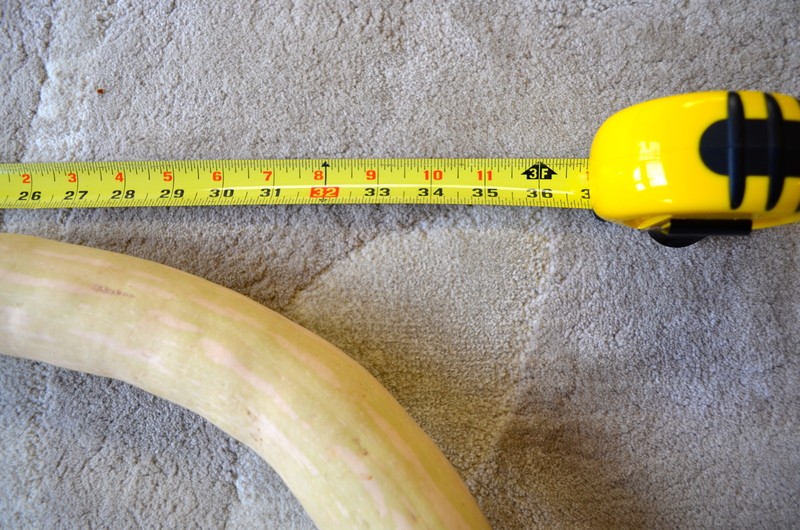 You are supposed to pick the fruit when they are about 10 to 12 inches like this squash below. Even this one we have been trying to eat all week and I have been putting it in miso soup, and sautéing it with some olive oil and salt and pepper. I even sliced it thin to put on pizza. 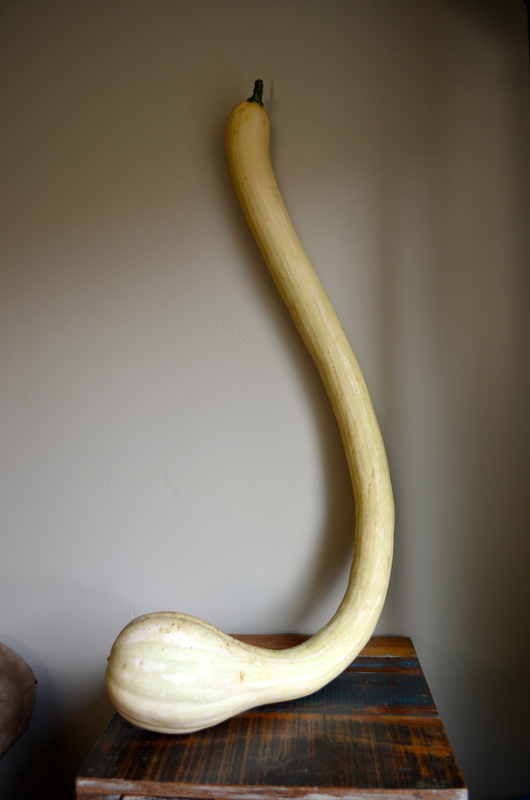 Even though we have been eating this one squash all week we still have about a fourth of the squash left! What is great is that the squash keeps well in the refrigerator and still hasn’t gone mushy on us at all. This is what the plant looked like on June 6 when I transplanted it into the ground. I transplanted two just to be safe but only one survived the transplant. I dug a pretty sizable hole when I planted them and added lots of my compost into the hole upon planting. 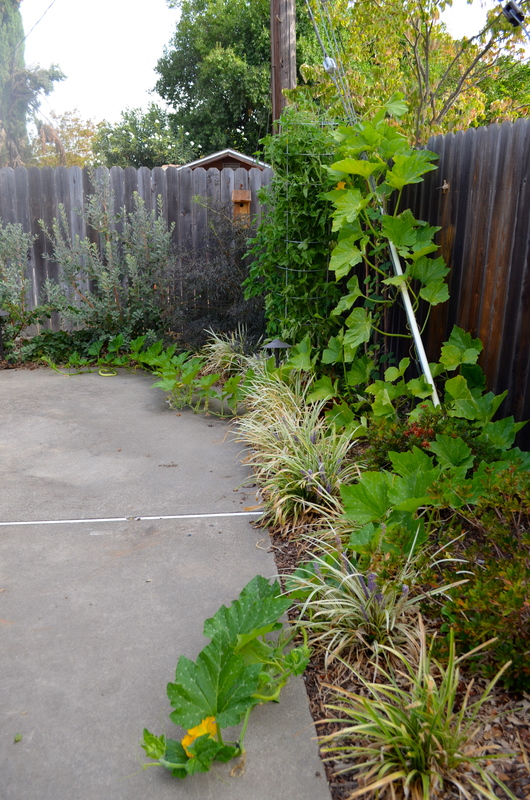 Squash are vigorous growers so rich compost is best for their growth. 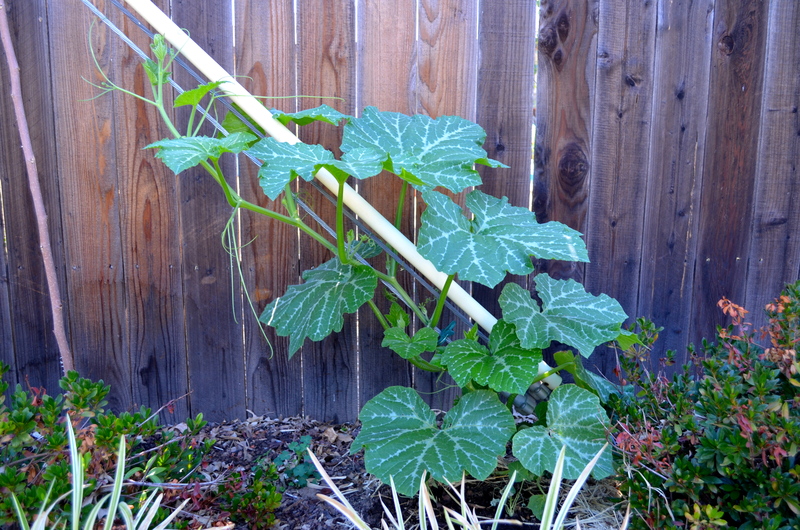 This is what the plant looked like in mid July growing up the power cable. 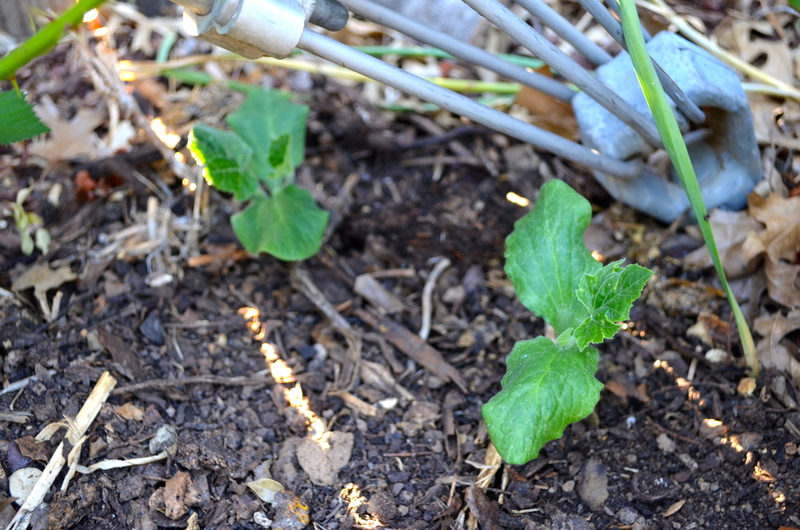 Here is what it looked like in late July when some squash finally started to form. And this is what the plant looks like today. There is one main branch climbing up the pole and two secondary branches going different directions onto the patio. The main branch actually has gone all the way to the back fence but fell down into the elderberry bush from the weight of the monster squash. I also interplanted some beans but they have yet to produce beans for me. In my opinion this squash is by far my most favorite. Even though this is a huge plant, the fact that it can climb is a huge plus in my small garden. 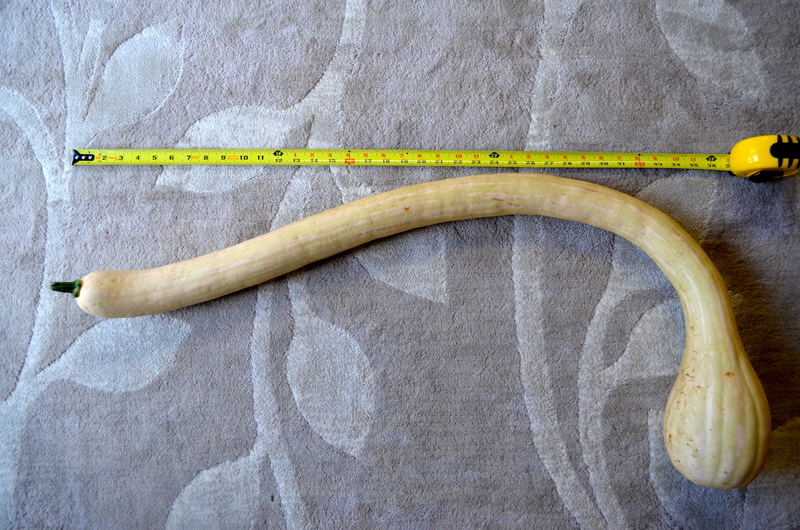 You generally need a lot of room for squashes so this allows me to have my squash while still working in a small space. 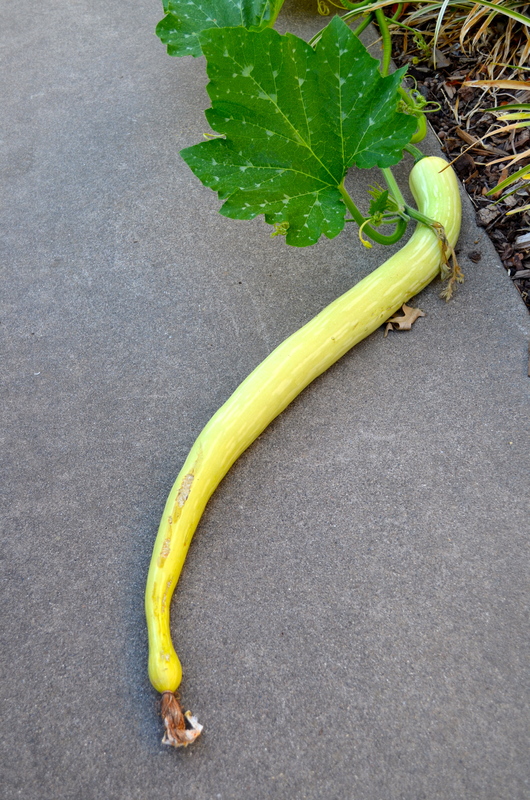 I planted some Black Beauty zucchini in the front yard as well but it only produced a few zucchini for me and then the plant completely fizzled in some of our hotter days of summer. I think next year I may forgo the Black Beauty and just plant more of the Trombetta! 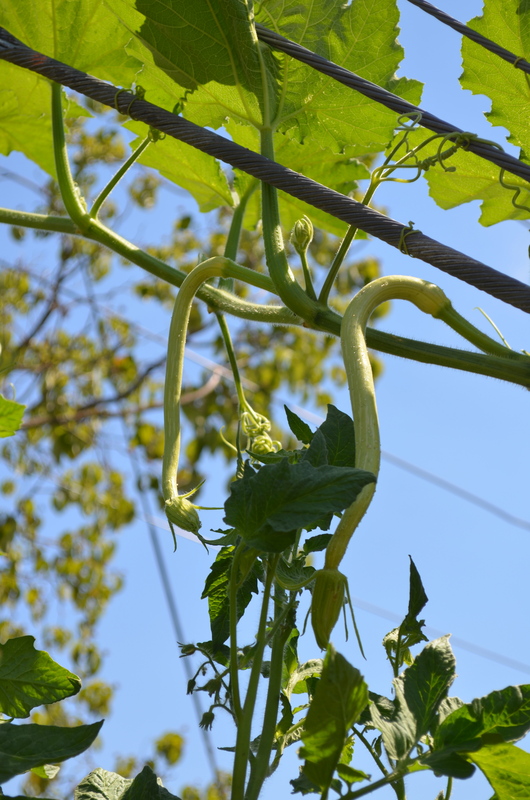 Tags: Black Beauty zucchini, climbing squash, small space gardening, squash, summer squash, Trombetta, Trombetta di Albenga | Permalink. Awhile back I saved some seed from my garlic chives and noted that I probably should divide the plants. 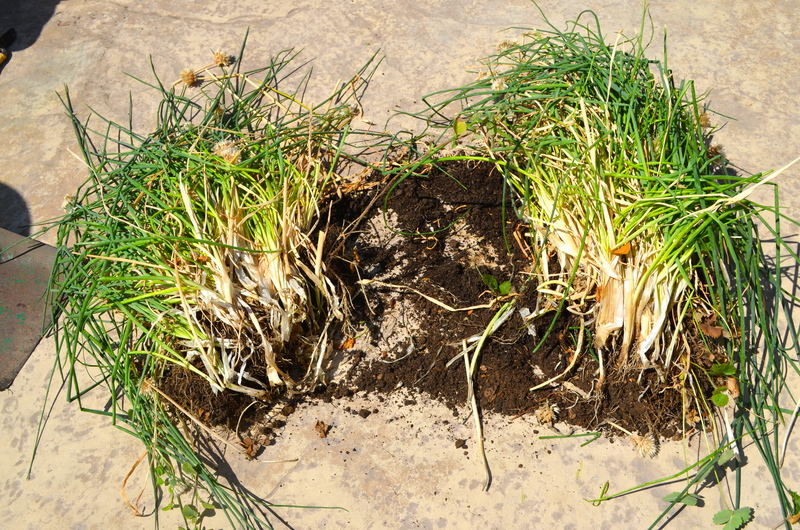 Well yesterday I got some extra time in the garden and decided it was the perfect time to dig up the chives. Actually I don’t know if it was the right time to divide chives but in my garden whenever I have time to do something it is the right time. 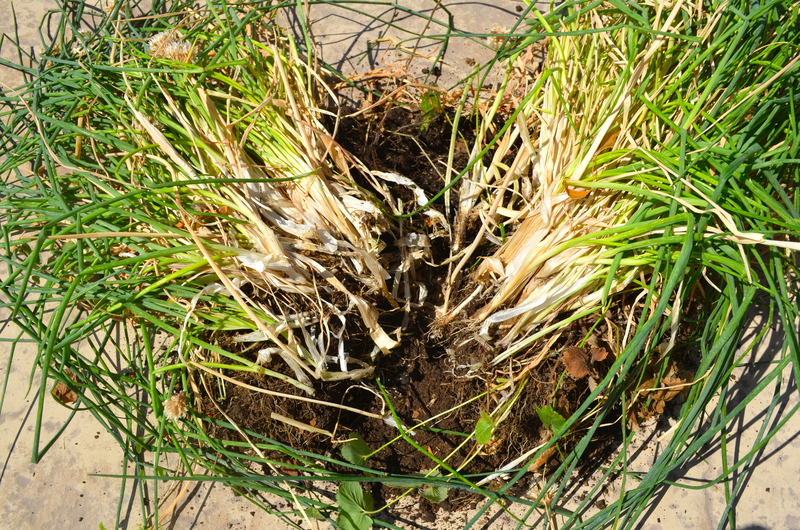 Chives grow in clumps and can get crowded so dividing them is a good idea for healthier plants. This is what the front herb bed looked like before I started. There are three main chive plants in the bed. 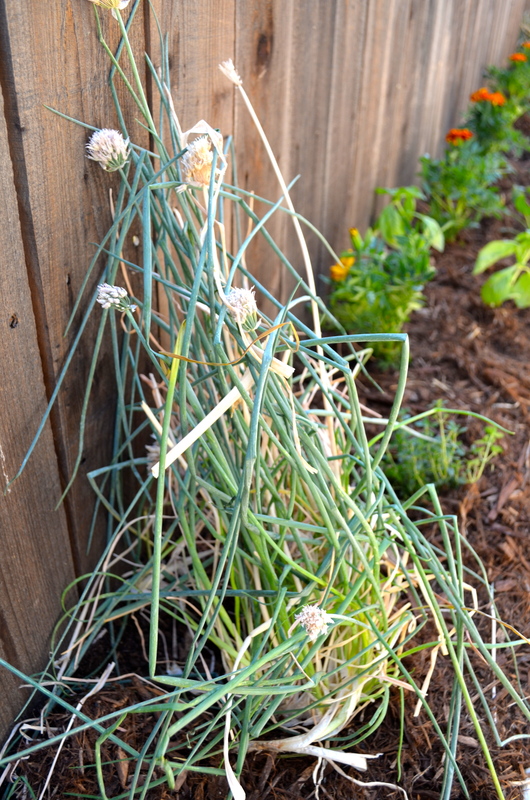 I used my pitch fork to gently dig up all sides of the chive plant. 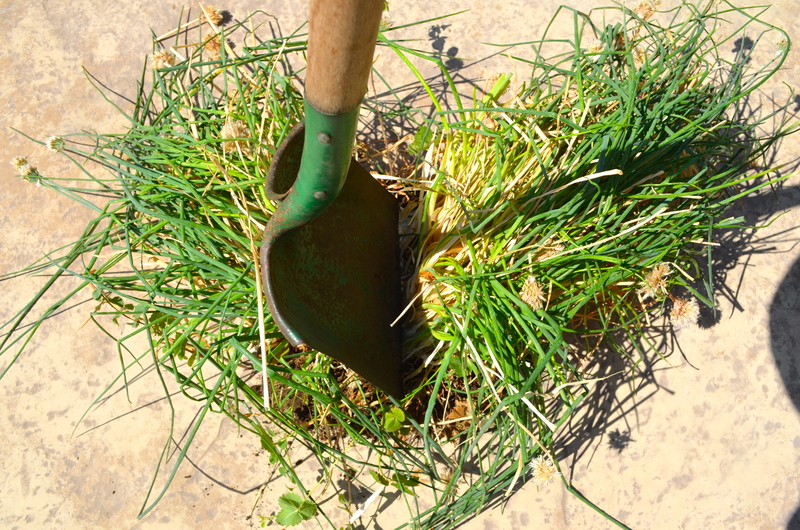 Then I used my shovel to split the chive plant in two. I cleaned up some of the dead parts of the plants as well. I put one division of the chive plant back into the original herb bed. Look, there is a landscaping rock that you can actual see now! I put the new division in my second herb bed along the fence. I think they will be happy in their new home. Tags: garlic chives | Permalink. 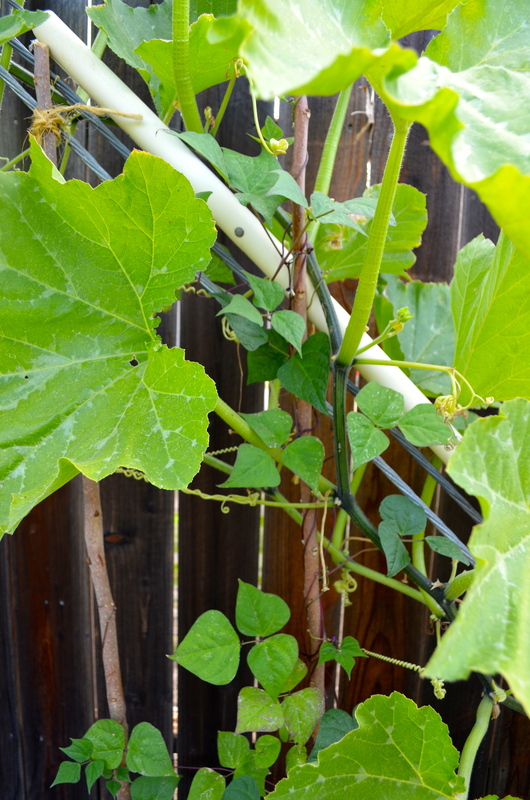 Several of my squash plants have been covered in aphids. I never worry too much about pests in my garden but when the aphids spread over to my young apple tree I decided it was time to do something. I haven’t seen many ladybugs in my garden recently so I decided to buy some lady bugs at the nursery. They come in packs of about 1500. Often times you release ladybugs and they just all fly away failing to stay in your garden and eat your juicy aphids. There are a few tricks to get them to stay. First of all make sure you have a food supply for lots of ladybugs such as lots of aphids on your squash plants. Adult ladybugs do not eat as much as their larvae but you need to encourage the adults to stick around and decide to mate in your garden in order to really get the benefits of adding ladybugs. Secondly, keep your ladybugs in the refrigerator until you are ready to put them out. 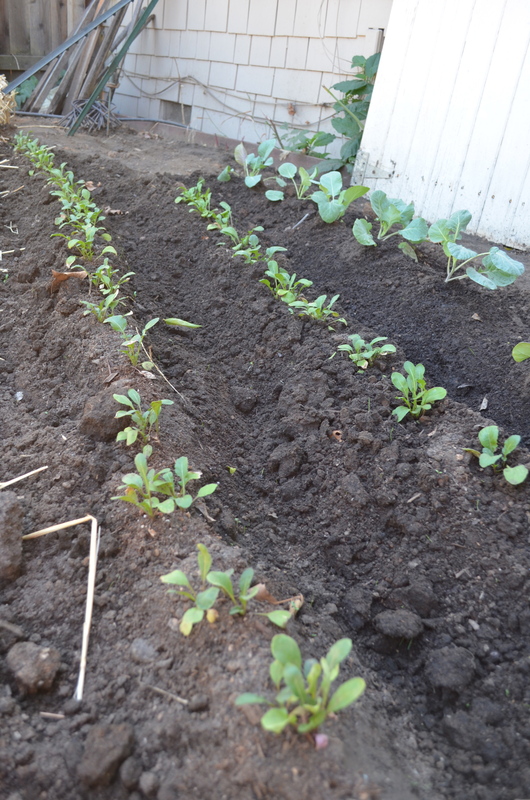 The cool temperatures keep them dormant but they quickly become active once you take them out. Release the ladybugs in the evening and spray your garden with some water so they have something to drink right away. All of these tips should help you keep your ladybugs from flying away as soon as you release them. Also don’t forget to create habitats that encourages ladybugs to stay. One year I found tons of ladybugs hanging out in my ornamental grasses in the front yard but they also like marigolds, yarrow, butterfly weed and lots of herbs. Plant a mixture of plants for shelter and plants for pollen. One more tip is to know what the eggs and larvae look like. Eggs are clusters of golden yellow eggs usually laid underneath leaves. Larvae doesn’t really look like adult ladybugs so make sure you know what they look like because they are your friends! Tags: ladybugs, organic pest control, pest control | Permalink. Since I harvested the bottom tray of my worm bin, it was the perfect time to set up a new tray for my worms. For my worm bedding, I have been using coconut coir fiber. The coir comes in a compressed block about the size of a brick and is made from coconut husks. It has a high water holding capacity and can hold up to 10 times its weight. I buy mine at my local nursery, Talini’s, for $2.99. The compressed brick expands when you add water so you really only need one. Just put it in a bucket, fill with a generous amount of water and enjoy the endless entertainment of watching something absorb water (I wish coconut coir would follow my daughter around whenever she drinks anything). Wait until the center of the brick has absorbed water. 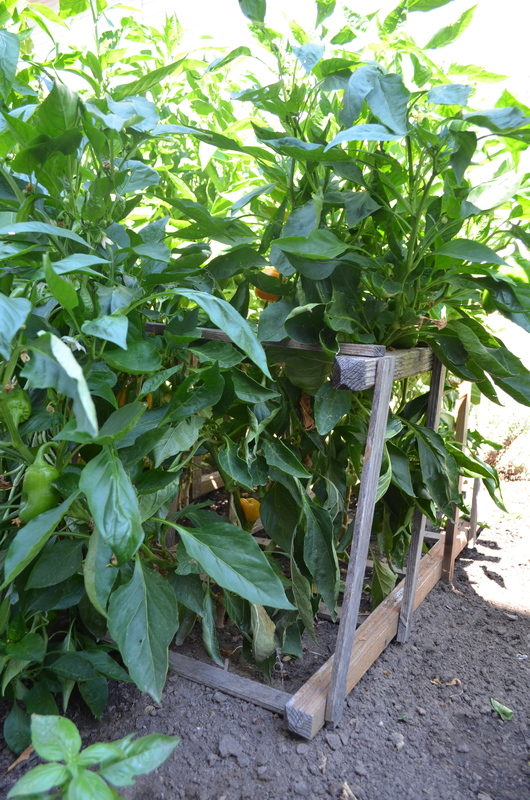 You can always wring out excess water if need be. I also like using shredded newspaper to add on top of the coir. The worms seem to really love the newspaper. Since I don’t subscribe to a newspaper, I save my Inside East Sacramento newspaper to shred for my bin. Tags: coconut coir, compost, vermicompost, worm bin, worms | Permalink. I have a Worm Factory worm bin inside my house. Actually it is in my dining room right next to our dining room table so if you have even eaten at my house you are sharing a meal with hundreds of worms too. I keep my worm bin inside because my garage gets really hot in the Sacramento summer and I am afraid it will hurt the worms. It actually has done great inside and hasn’t been a problem at all. I still can’t believe my husband allowed the worms to come inside but once they were in he hasn’t mentioned them. I have been meaning to harvest the bottom tray of my worm bin for awhile now. This is what the bottom tray looked like before I harvested. I dumped the contents out onto a tarp outside. You can see the worms at the bottom. In the Worm Factory worm bin there is a bottom tray that catches any water run off and there is a spigot where you can collect your worm tea. However, this is where I found the richest worm castings. 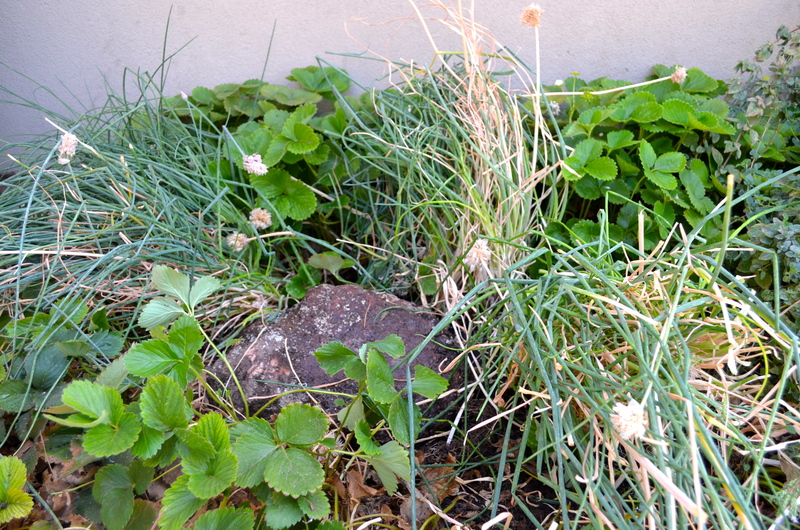 Just look at this stuff… it is truly rich soil! All the legs fall off and you end up dropping your worm bin… worms and all! Sorry worms… its bad design, not an earthquake that did that to you. I think I am going to ditch these legs and find another solution. Or maybe it is time for another bin?!? Tags: harvesting castings, vermicompost, worm bin, worm castings, Worm Factory, worms | Permalink. Eggshells are always a great addition to your compost because they provide essential grit for worm’s digestive systems and the calcium in eggshells can help neutralize acidic conditions in your compost pile. I have always just thrown in my eggshells along with everything else but they always take so long to decompose. This is nine month old compost and you can see that there is still a large remnant of eggshell in the compost. I have always wondered how the worms actually get the benefit of the eggshells if they are often still in the exact same shape as when I threw them into the compost months ago. I know the worms are not taking huge bites out of these shells (haha, worms don’t have teeth). Some gardeners don’t like the look of eggshells in their compost and wont include them but I don’t really mind the look. However, I was thinking that ground up eggshells would be easier for the worms, especially the worms in my worm bin, to process. I started separating eggshells from my kitchen compost bin, slightly rinsing them, letting them dry and putting them in a separate container. When I had enough I lined them on a cookie sheet. The next time I had the oven on for tomato sauce I threw in the pan of eggshells too. I wasn’t so concerned about the temperature but just wanted to give them a while in an oven. So the eggshells sat in a 350° oven for about an hour. Then they went into my food processor for a quick whirl. I was much happier with the consistency of the eggshells using this technique. Previously, I had tried blitzing some eggshells in a blender but without putting them in the oven and I wasn’t able to get as fine of a powder as I was by baking them first. I don’t think I will use this technique all time but will definitely use it from time to time to add to my worm bin. I have noticed that halved eggshells in the compost provides perfect pockets for pill bugs, worms, and other little insects to set up camp in the compost pile mainly because eggshells don’t tend to break even with the weight of the compost material on top of them. Come to think of it, when I am in the kitchen using eggs I always think of how fragile the eggs are but those same shells are surprisingly strong in the compost! I have always noticed when I turn my compost lots of little insects coming out of the safe pockets of the eggshells. There are definitely benefits to the lazy-woman’s approach to adding eggshells to the compost! I think I will also use the oven-baked eggshells next year to put in the bottom of my tomato holes (usually I just throw in a few whole shells) but maybe the plant will be able to utilize the calcium faster if it is crushed up. Something new to try! I do hope the oven-baked eggshells will keep my worms happy! Tags: compost, compost pile, eggshells, vermicompost, worm bin, worms | Permalink. During the summer months there is always a glut of tomatoes to harvest although this year my tomato harvest has been quite disappointing. Nevertheless, I love this roasted tomato sauce recipe from Hugh Fearnley-Whittingstall’s River Cottage Veg cookbook. The recipe is easy, and can be used many different ways. I was excited that I had all the ingredients on hand from my garden (minus the olive oil and salt and pepper)! It was really nice to know that everything in this particular batch of tomato sauce came straight from the garden. Preheat the oven to 350°F. Lay the tomatoes, cut side up if halved, on a baking sheet. Scatter over the garlic and herbs and trickle over the oil. Season with plenty of salt and pepper. Put the baking sheet in the oven for about an hour, maybe a bit longer, until the tomatoes are completely soft and pulpy, and starting to crinkle and caramelize on top. Set the tomatoes aside to cool for half an hour or so. Then tip them into a large sieve set over a bowl and rub the pulp through with a wooden spoon or use a food mill. Discard the skins and seeds. Your tomato sauce is now ready to use. I don’t use marjoram but replace it with a few springs of fresh rosemary. Also, after I pull the tomatoes out of the oven and they have cooled, I put the tomatoes in my food processor for a few whirls until I get a nice sauce-like texture. I don’t bother to food mill my sauce because I don’t mind skins in my sauce. I transfer my whirled sauce into a sauce pan and let it gently simmer on low heat for about a half hour. Then I season to taste. If I am not going to use my sauce right away I put it in mason jars and freeze it. Because there is a bit of oil in this recipe, I don’t can it. Tags: freezing, from garden to table, Hugh Fearnley-Whittingstall, preserving, recipe, River Cottage, River Cottage Veg, tomato | Permalink. 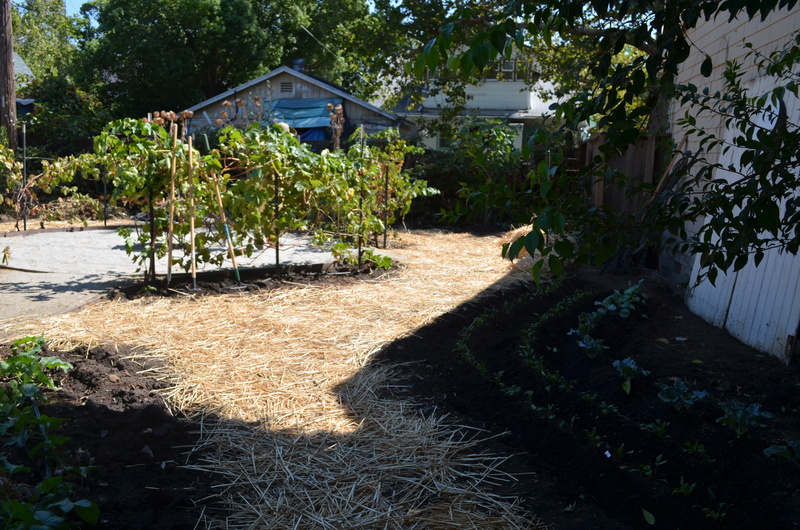 Big News: East Sac Edible Gardens Tour! 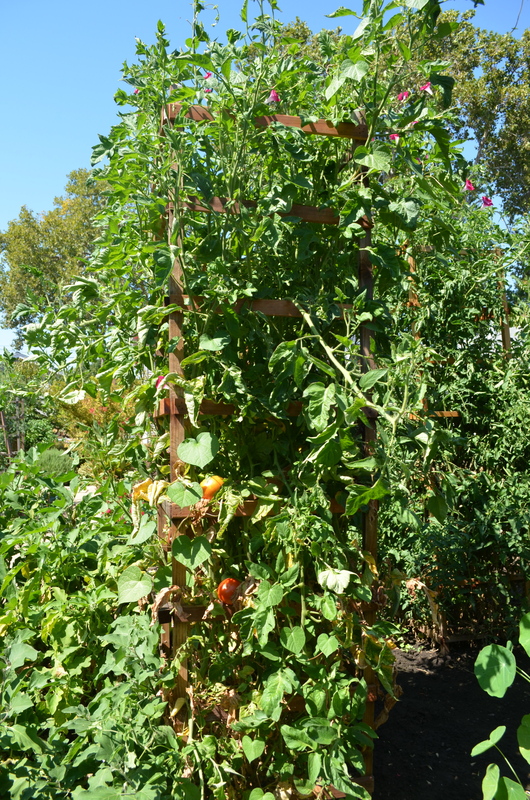 Every year the Soroptimist International of Sacramento puts on a fundraising event called the East Sacramento Edible Gardens Tour where 6 gardens are featured. And guess who’s house will be on the 2014 tour? MINE!!! Since I moved to Sacramento I have gone on the last two tours. 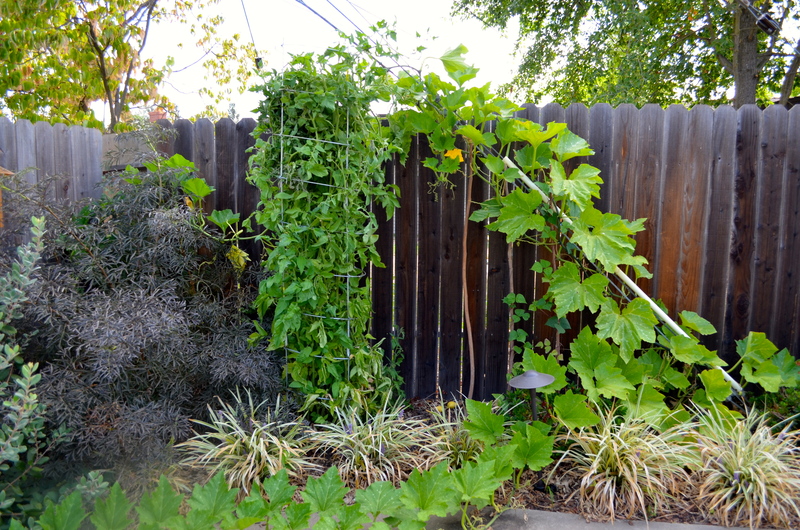 It is one of my favorite East Sac events because it has to do with edible gardens. 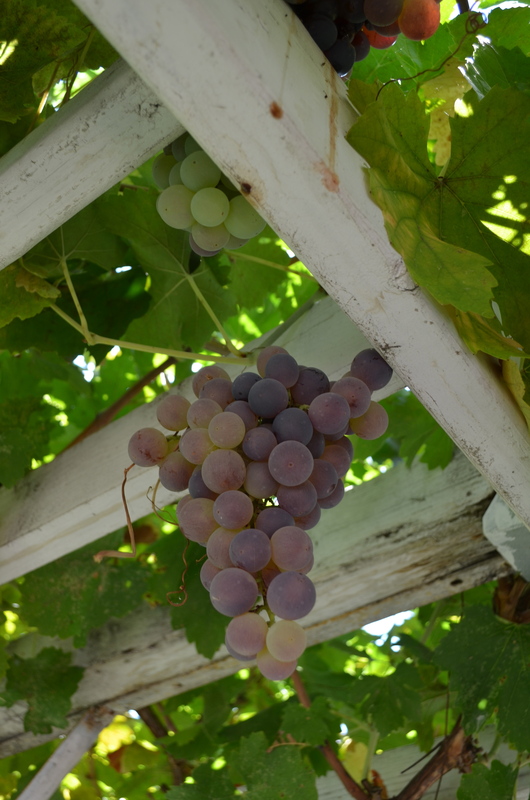 There are plenty of other house tours in Sacramento but this one is dedicated to people growing food. They have a master gardener stationed at each house and musicians from Sacramento Symphonic Winds to provide lovely music as you stroll through the gardens. Soroptimist International of Sacramento puts on this event as their fundraiser and proceeds go to support women and children in the Sacramento community. This year’s tour proceeds will go to the St. John’s Shelter Program for Real Change which helps mothers in crisis to improve their quality of life and enrich the lives of their families. 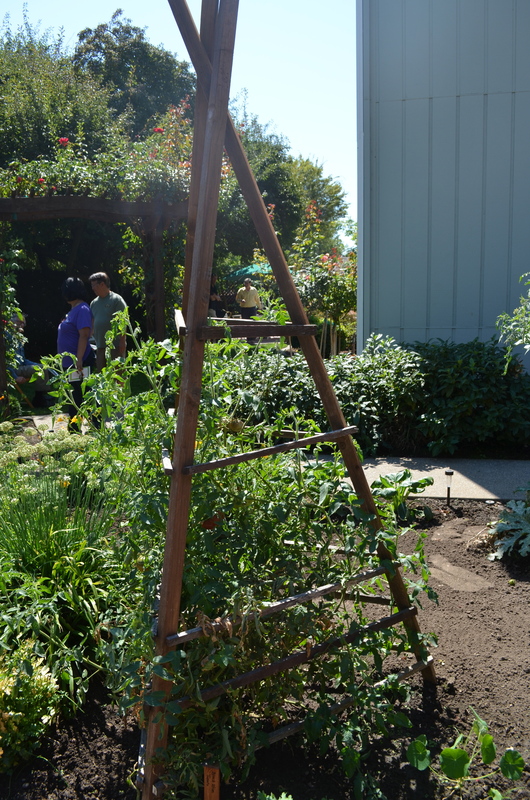 The garden tour funds will directly support their Employment Readiness Program to help mothers gain and maintain employment. The second charity is Sierra Forever Families which works helps foster children connect with nurturing permanent families. The garden tour funds will directly support Camp Wonder where foster youth connect with adult mentors. So if you go on the tour you can feel good that your dollars are going to help our community. Did I mention that MY HOUSE is going to be on the tour?? I told my husband that this is the best thing to happen to me all year! I am really very excited about it. Saturday, September 13, 2014 from 10AM-4PM. 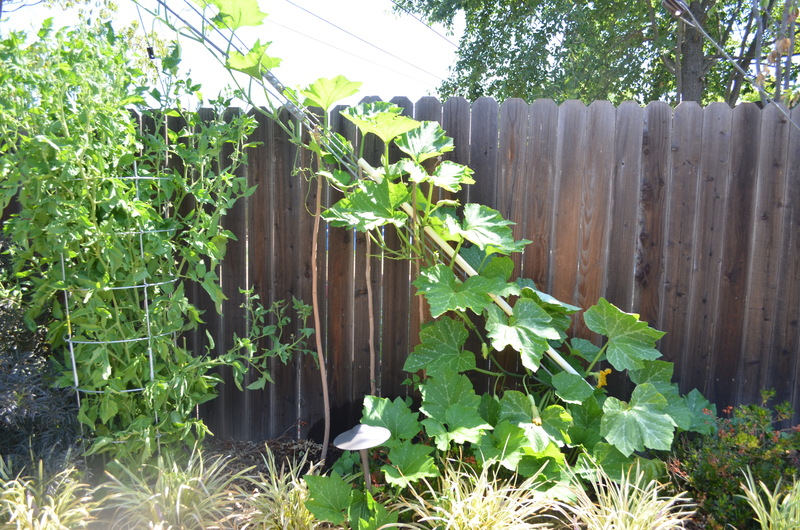 Tags: community, East Sac, East Sac Edible Garden Tour, edible garden, edible garden tour, edible gardens, garden tour, Soroptimist International of Sacramento | Permalink. So awhile ago I posted about my gardening nightmare and it looks like my nightmare just got a bit bigger. Look at the size of this guy!! He was happily munching on my tomato plant before I got him and disposed him. The most frustrating thing is that I have only been able to find about 3 hornworms so far on my plants (which doesn’t sound like a problem)…. except I know there are more that are just so well camouflaged that I can’t seem to find them. I go outside to stare at my tomato plants and my eyes go blurry from staring at all the green. I know they are there because of their trail of poo but my eyes just can’t focus long enough to find the monsters. Or maybe I just don’t have that many hornworms this year… yeah… let’s go with that. I like that answer better. Tags: hornworm, tomato hornworm, tomatoes | Permalink. I took a little trip out to Pescadaro over the weekend. One of my most favorite stops is the Harley Goat Farm. I have been to this farm several times now and every time it is just as charming and well worth the stop! This working dairy farm is a perfect place to visit with some goats, sample their cheese in their cheese shop and enjoy the beautiful weather and scenery of Pescadaro. The farm buildings are painted with their own goat milk paint which they also sell in the store. They also are very water conscience and collect rain water in large cisterns. You can get right up to their herd of goats and they even had a 3 week old goat out for visitors to see. There is also a small herb and flower garden which they use to grow their own edible petals and herbs to add to their cheeses. Inside the building they have a hayloft which they use for their seasonal farm dinners. The dinners are a communal five course meal prepared with ingredients from the farm or sourced locally. The loft is really a magical place and has a small deck that overlooks the farm. I would love to eat dinner here one day although it would have to be a special occasion at its price point! Perhaps my most favorite part of the farm is the cheese shop. Enter through a vibrantly goat milk painted door and you are greeted by a row of baskets to fill with your choice of beautiful cheeses, infused oils, honey, or goat milk body products. Personally my favorite cheeses are their feta (which is on the salty side) and their apricot goat cheese round. They also sell freshly made goat cheese ravioli, farm eggs and cheesecake. If you do come to visit do bring a cooler to put your cheeses in for the ride home or bring your own baguette to eat your cheese right away on the beach (a 5 minute drive from the farm). The cheese shop doesn’t sell any crackers or bread so I always like to bring some along. You can also pick up bread at Arcangeli Grocery on the main road. I highly recommend the Garlic Herb Artichoke Bread. Yum! If you are a cheese lover and you are looking for a little day trip, this is the place for you! Tags: cheese shop, edible flowers, farm dinner, farm tour, farms, garden tour, goat cheese, Harley Goat Farm, Pescadero, travel | Permalink.